I’ve always been one of those pony obsessed girls. 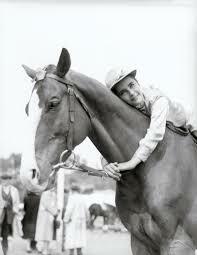 That’s sadly not me but a 12 year old Elizabeth Taylor starring in a horsey film called National Velvet. What I don’t understand is how anyone can resist them. Their delicious smell, their velvety noses. I’m talking about horses here not rag and bone men…. But I never had a pony of my own. I read a story in one of my Christmas annuals – where the girl pulled open her bedroom window and there was a pony outside the house and wished so hard that would happen to me. But it was never going to happen.I lived with my teacher Mum and tailor Dad in a terraced house in North London. I spent my whole childhood as one of those sad eyed girls who hang around riding schools desperate to do anything – muck out, clean tack until my fingers bleed – just to be around ponies. I loved the forge. It was black with soot and grime an the fire glowed red. The sound of the hammer on the anvil, the rythm of it. Then the clouds of smoke as the hot shoe was fitted to the horses hoof. The smell of burning and the hiss as the smith cooled the shoe in a bucket of cold water once he was sure he had the shape. The old blacksmith retired when I was about 10. His son took over and only made gates. Gates! I was sad for a bit but then started helping out at the pony trekking centre in the village and got my pony fix that way instead. When I got old my dream came partially true. 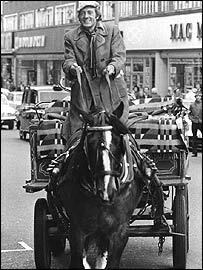 I had a share in a pony (called Spangles if you must know) we kept at Hackney City Farm and rode her in London Fields and later – this really was a dream come true – Hampstead Heath. This is a photo of me and my daughter on Spangles in Victoria Park, Hackney. My first ever (and not very good) novel was a pony book. Maybe I’ll write another one day. But I have just written a TV script with a smith as the hero. It’s set in the past of course, but those memories have been very useful. And since I’ve moved to the coast I’ve started riding again. Which prompted this post. Here’s my new friend, Summer, who spookily, is piebald too. Can I just say that everything – bluebells, butterflies -looks better from up on a horse. But maybe that’s because I am short. My last book Sawbones, won the Young Quills award 2013 for best historical fiction, but sadly there are no ponies in it at all. My next book, The Curious Tale of The Lady Caraboo, does in fact have a small amount of galloping. But not half as much as Poldark. Tags: Blacksmith, Horse, Pony, The Curious Tale of The Lady Caraboo. Bookmark the permalink. Love the description of the forge! And I remember the milk man’s horse – tall as the sky! Very nice having glimpses into your past! I’m glad you are back into riding again, I myself am a re-rider after taking four years off for university. 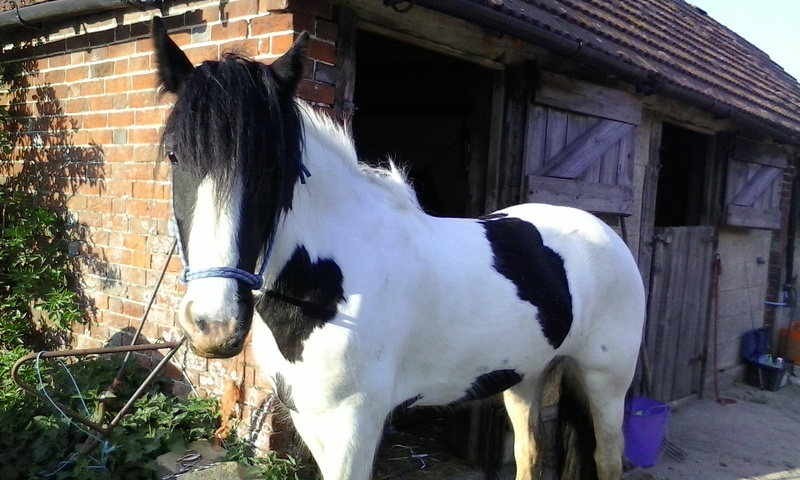 I was lucky enough to have ponies when I was younger – few friends who didn’t want my pony rather than me – but that didn’t matter when I disappeared into the countryside with just my four-footed friend for company. Think of a Thelwell cartoon and that was me!